Chilwell Road Methodist Church, Chilwell Road, Beeston,Nottingham, NG9 1EH. An opportunity to perform truly grand-scale ceremonial music by Biber and Schütz! Both works are composed for soloists and choir in 8 parts and a mixed consort of instruments in up to 16 parts - giving massive scope for varied combinations and textures, culminating in glorious resounding tutti sections. Biber's Vespers - consisting of Dixit Dominus and Magnificat plus Sonatas - was composed towards the end of the 17th century at the Court of the Archbishop of Salzburg. Schütz's Psalm 24, composed later in his long life (d 1672), shows the Venetian influence of his studies with Gabrieli. By comparison, the roughly contemporary Mass by Padilla seems almost modest - set for just two choirs of voices and instruments. Jazzy Latin-American rhythms characterise this music - the composer, an ex-pat Spaniard, being influenced by the context of the New World in Mexico. 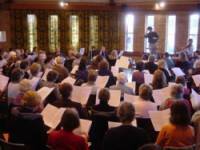 Director Richard Roddis is well-known throughout the East Midlands for his work with choirs. His conducting experience stretches back more than a quarter of a century and, as a professional singer and a member of several top choirs, he brings a wealth of experience and enthusiasm to choral conducting. He was appointed Director of the Sinfonia Chorale in June 1991. Instrumental specialist Nicolette Moonen is a renowned Baroque violinist. She has performed with most of the country's leading period instrument ensembles and has been increasingly in demand as a leader and teacher. She teaches at the Royal Academy of Music in London and the Birmingham Conservatoire.